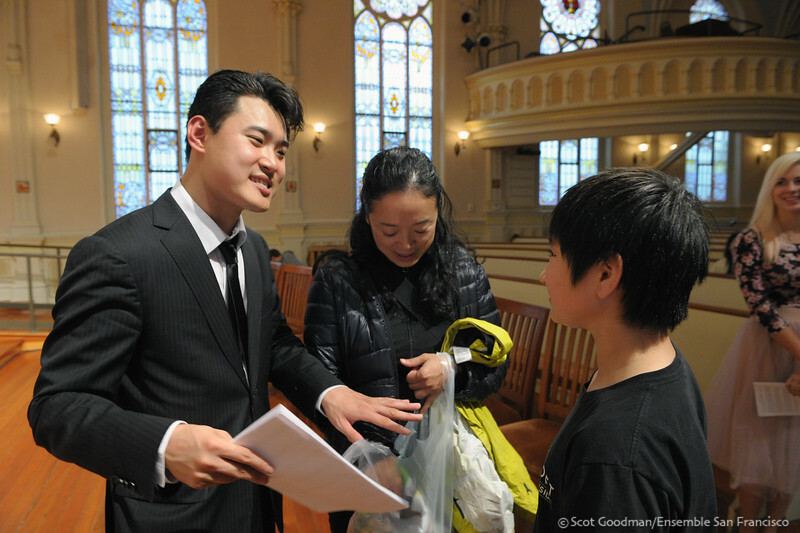 ESF performed the Schumann Piano Quartet as part of the 10th anniversary of SF Music Day, one of the Bay Area’s top free music festivals, located in downtown San Francisco. ESF performed on the main stage at Herbst Theater. Elizabeth Schumann, Rebecca Jackson, Daniel Stewart, and Jonah Kim performed the Schumann Piano Quartet at the intimate Tivoli in Throckmorton Theatre, Mill Valley. Wednesday Noon Concerts are offered complimentary to the community each week from September through July. April 9, 2016—ESF presented a blend of classic and modern: well-loved Brahms and Mozart alongside the contemporary Sextet for Clarinet, Strings, and Piano by Sheridan Seyfried. After the concert, musicians and members of the audience celebrated at Muka wine bar in Hayes Valley. 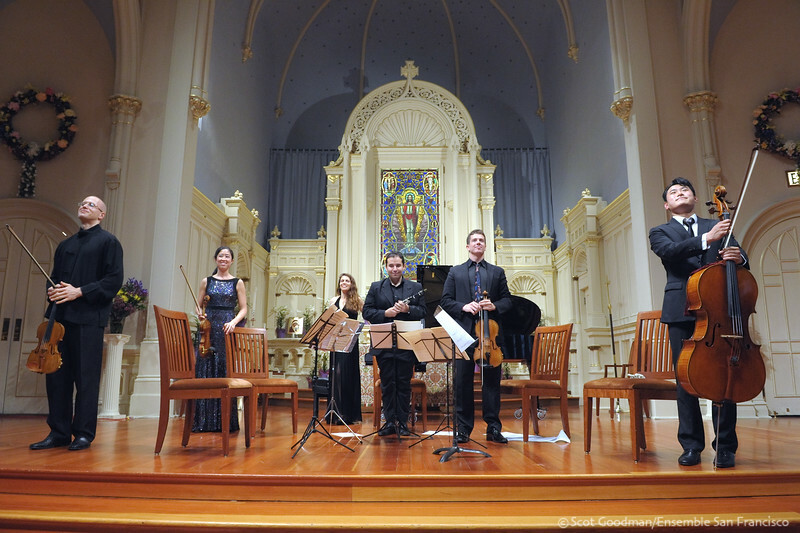 This concert was made possible through a generous grant from San Francisco Friends of Chamber Music. April 3, 2016—ESF presented a blend of classic and modern: well-loved Brahms and Mozart alongside the contemporary Sextet for Clarinet, Strings, and Piano by Sheridan Seyfried. Jonah and Christine performed the Brahms Cello Sonata No. 2, Op. 99. This was a free concert at UCSF’s Cole Hall. 12:10 – 12:15 pm Poetry reading by David Watts, M.D. 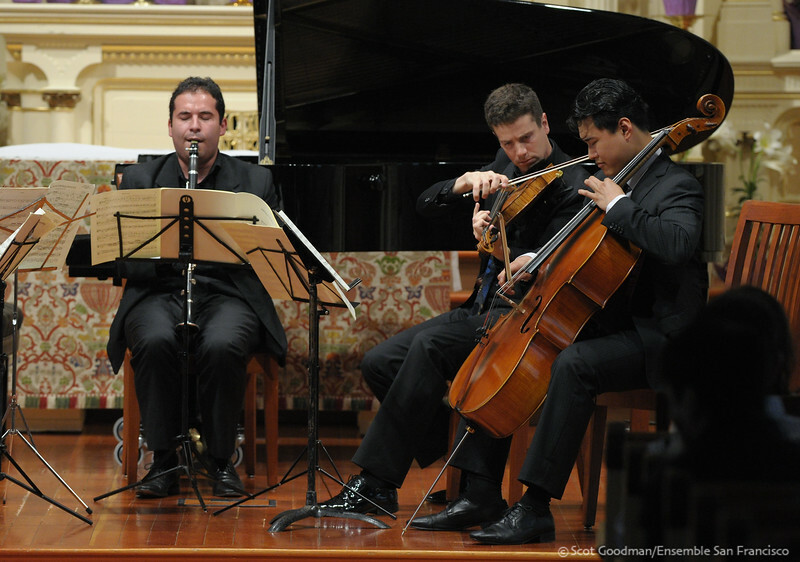 ESF performed as part of the Berkeley Chamber Performances series, presented at the Berkeley City Club. 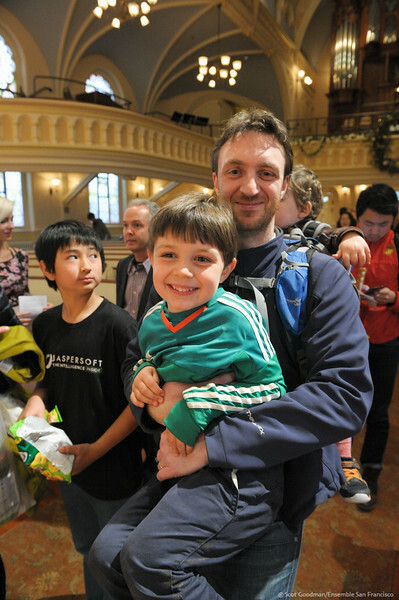 ESF welcomed the new year with a program full of glorious melodies, as well as more than a bit of pure silliness. Rufus Olivier and Christine Payne began the evening on a charming note, with the Bassoon Sonata by Camille Saint-Saens, full of both pastoral and humorous moments. Next, acclaimed mezzo-soprano Betany Coffland joined the ESF string musicians for Respighi’s Il Tramonto (The Sunset). Composed in 1918, the piece was a success from the start. The whole work is pure musical poetry, intense in its expressiveness, crystalline yet colorful in its instrumentation, and delicate in its harmonies. merest thread of accompaniment. Last was the tremendously fun Café Music for piano trio. Composer Paul Schoenfield explains, “My intention was to write a kind of high-class dinner music that might (just barely) find its way into a concert hall. The work draws on many of the types of music… early 20th-century American, Viennese, light classical, gypsy, and Broadway styles are all represented.